with resultant algae problems, most recently a brown diatom algae bloom, in 1 year + established tank (albeit recently moved). I am currently experimenting with different air-valve openings, but after reading something Anthony wrote on this site regarding the feed water, and the top two inches of water being the most protein-laden, I am wondering if the issue lies with the mechanics here, as it were. I was hoping to offer a description of how I am feeding water to this skimmer, for your venerable selves to critique. Firstly, the weir edge (approx 30cms) surface skims the display tank (200 litres), and fills the weir right to the top, due to a tall standpipe (HGB attachment). In the weir are two external filter intake tubes (J-shaped), taking water in a syphon from about the middle of the weir. Below, the skimmer (with extension kit) sits in the first narrow compartment of the sump. The two siphons feed into this compartment; one at the base, and one at about 10cm from the base, in an attempt to flow water evenly around the body of the skimmer. The main drain from the standpipe is just a trickle, that exits about 10cm below the water level. All this was put together, both to run the tank silently, and to keep the water as calm as possible (quiet zone please, say the instructions), for entry into the skimmer. Could this arrangement be inhibiting foam production, principally because the majority of the water is sucked from deep water in the weir, and exits deeply in the sump? <Only nominally; or put another way, conveying more likely skimmable water to and through the skimmer would get you single digit improvement here. Should I aim for agitation of the surface water in the first section of the sump, where the skimmer resides, although the instructions state to place the skimmer in a quiet zone? Should I shorten the external filter intake tubes, so that they pull water from nearer the top of the weir? Would these modifications be significant, or cosmetic? Am I on the right track, or is there a harsher truth regarding this unit? Any help that you could offer would, as ever, be highly appreciated. PS - have been enjoying/perusing Reef Invertebrates. Content is excellent. 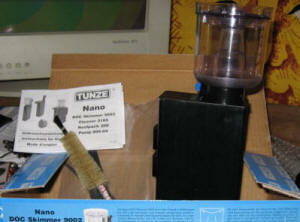 I have recently upgraded skimmers from my Aqua C pro skimmer to a Tunze 9010 for my 120 gal reef. It was working amazingly until a few days ago. I e-mailed Tunze with no response yet. I stopped the skimmer for a red slime treatment for about 48 hours. When I turned it back on it will not run for more than about 1/2 to 1 minute then shuts off for about 10-15 minutes. It repeats this pattern all day. I have collected no skimmate at all. I have taken it apart to be sure it was clean and operational. Not much build up - it is only about 5-6 weeks old. My tank is about 2 years old - upgraded from a 24 gal to 55 gal now to 120 gal.